Well, Thanksgiving’s over and so is tour season. Aside a tour here and there, most guides are spending the next two months sitting by the fire and glad to escape winter’s cold. Strangely, the season ended with a flourish –five tours in 10 days. Folks from London to Atlanta to Boston to I can’t remember. It felt like springtime. But along the way a couple unique experiences showed there’s always something new ahead. The first was at Ford’s Theatre where I’ve been hundreds of times given I specialize in Lincoln assassination tours. The theater was closed as they readied for a new play, but we could go to the balcony. The ranger mentioned the Lincoln box was open. Took me a half second to head over to the room that’s normally sealed. 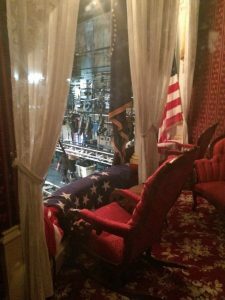 Finally, a chance for an up close look at where Lincoln was shot. I’ve heard of the door being opened, but never saw it until now. My tourists seemed only slight impressed. I was the one walking away with a big grin. Hey, works for me. The second came at the Supreme Court. After seeing the chamber, I noticed people exiting across the hallway onto the second-story balcony above the tall steps in the building’s front. Again, a half second later, I was there taking in the view. Maybe this happens more often, but it was my first time in eight years of guiding. It just shows an old dog does find a new bone now and then. 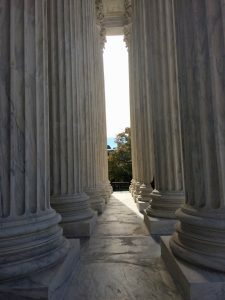 This entry was posted in Washington life and tagged Best Washington DC walking tours, Ford's Theatre, Lincoln assassination, Photos by Rick Snider, Supreme Court steps. Bookmark the permalink.